The market rally has reached an almost comically delusional high. Bad news comes out. They say, “No problem. It .” Market goes up. Good news comes out. They say, “The recovery is real. There’s still time to get in. Don’t miss out.” Market goes up. The market rally has been almost bulletproof and this earnings season has only made it stronger. Currently, 83% of S&P 500 companies that have reported have beaten analyst expectations. It’s on pace to be the best performance for earnings vs. estimates since 1993. Expectation hurdles have been low set exceptionally, but in the current stage of the market rally any news is good news. But it’s times like these, when the S&P 500 has had only seven down days in the last five weeks, when it’s time to look at when this rally will end. Because it will end. It will end badly. And history shows most investors will miss out on the further gains to be had and will go “all in” just in time for it all to fall apart. Here are three ways to know when the rally is about to end. It’s no secret that mutual fund investors, as a whole, are some of the worst investors. They buy during the good times and sell during the bad times. They consistently do the exact opposite of what successful investors do. Retail investors – a.k.a. average Joe investor – reached a near panic (in 2008). They wanted out. They wanted out completely. And they wanted out now. Too see how badly they wanted out during this downturn compared to the tech crash, just look at the chart below which tracks mutual fund inflows and outflows. Mutual fund investors ran for the exits during two of the sharpest market downturns in the past decade. And they sold the most at the bottom. Right now, with the memories of the cyclical bear market still fresh in their minds, they haven’t come completely back to the table yet. Last year the hottest place for mutual fund investors were putting their money was in bond funds. The flight to safety trend is no different this year. 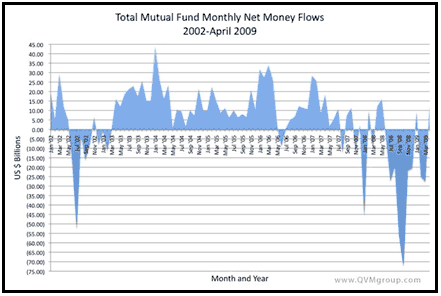 Stock funds had net inflows of $20.3 billion in the first quarter of 2010 according to Morningstar. Bond funds, meanwhile, had a net inflow of $88.5 billion. Mutual fund investors are still looking for the perceived safety of bonds even though bonds will get crushed due to the most important megatrend in the markets today. They haven’t returned to stocks in a big way like they do and will again at a market top. For example, I came across an article from CNBC extolling stocks: Miss the Rally? It’s Not Too Late, But Don’t Wait Too Long. There’s still a lot of investors who haven’t come back into the market. When they do, we’ll know to keep a close eye on the background. Another thing that happens when markets tend to top out is the cost of insurance against a significant downturn in the markets gets very, very low. Most institutional fund managers buy “portfolio insurance” to help protect themselves against a market downturn. They do this by purchasing put options (the right to sell a stock or index at a predetermined price) against a major index. When stocks are doing poorly, insurance demand and prices are high. When stocks are doing well, insurance demand and prices are low. Demand for insurance is not at lows which have typically marked market tops in the past right now. The way to track the cost of insurance is through the CBOE Volatility Index (a.k.a. the VIX or the “fear index”). The VIX tracks the premium associated with option contracts of the S&P 500 Index. As the chart below shows, the VIX is low, but not too low. The VIX is currently at 17. That’s far below its highs above 90 during the fall of 2008. And it well below the past highs when it went above 40 during market downturns in 2001 and at the post-dot-com bubble bottom in 2002. It is, however, well above its all-time lows below 10 in 2007 when “subprime” was a term used in realtor and mortgage loan offices instead of on Wall Street. Finally, when the market tends to top out there are many common indicators that in hindsight always seem to be so obvious. In the past it was “new eras” or “new paradigms” that helped drive the markets to unsustainable highs. The best example was during the tech bubble when investors were more concerned with a company web site’s “stickiness” or how many “eyeballs” it was getting instead of price-to-earnings ratios. It’s also when long-term investment strategies are viewed as antiquated and no longer valid. Remember in 2008 when everyone said buy and hold is dead? Or when legendary value investor David Dreman was fired shortly after sitting down with us and talking about the excellent values in bank stocks just days before the current rally started? Right now those big shifts in thinking haven’t happened yet. They will. And when they do, we’ll know the end is near. In the end, there is still a lot to be concerned about in the markets today. Greece is going to be facing debt problems for years. We continue to expect its budget cuts to be smaller than expected and its increased taxes to not produce the expected increase in income. Higher taxes are coming to the United States. Whether they’re direct taxes like a Value Added Tax or indirect taxes through more regulations that drive up costs and reduce efficiency, they’ve come and they’re coming. Then there’s the unemployment, housing, inflation, rising interest rates…you get the point. Despite it all though, the markets continue to march higher. The P/E ratio of the S&P 500, based on the past 10 years of earnings, is sitting at 21. There is a big correction coming. It could come quickly or it could be long and slow. But we do know it will be unexpected by most. The three indicators above show it’s not likely to come to an end anytime soon. In the next Prosperity Dispatch we’ll look at a sector which is primed to move up in the short-term and long-term. And it’s a great place to be whichever way the markets are headed.